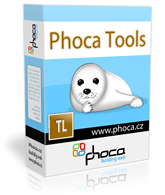 The Phoca Server Unzip tool unzips the archive file on the server. Donwload the tool file from this server. Extract the file on your disc and copy the folder tool_phoca_server_unzip into your server (into the folder where you want to extract the ZIP file). Copy the ZIP file into the same server, into the same folder. E.g. you want to extract example.zip file on your server https://www.your_site.com/. In this case you should copy the tool_phoca_server_unzip folder and example.zip file into the root of your server. After copying the files open your web browser and go to https://www.your_site.com/tool_phoca_server_uzip. FTP enable - you can enable the FTP layer for extracting the file(s). You should enable the FTP in case, your server runs e.g. on Linux or FreeBSD. Because of ownership or permissions. If you extract the file(s) with help of this tool (it means via WEB not via FTP), then you cannot manipulate with the files e.g. via FTP because of ownership of the extracted files, only via web file manager. Maximum Script Execution Time - you can increase the maximum script execution time in case your server allows it. Run this script only if you know what you do. If you enable the FTP layer, you should not extract big files, because the extracting with help of FTP is slow. Try to split large archive files. Maybe your server does't support some PHP ZIP functions. In this case the extracting will be slower and uselessness for large archive files.